As part of the 2015 POPSUGAR Insights Food study, we surveyed female visitors to POPSUGAR to better understand their grocery-shopping behaviors. One of the areas that was of particular interest was identifying the decision drivers that propel women to try new foods, discover new brands, and shake up their weekly kitchen routine. First, we wanted to understand if women were open to new foods or if they qualified as "fixed-food eaters" — women who typically stick to the same old foods day in and day out. 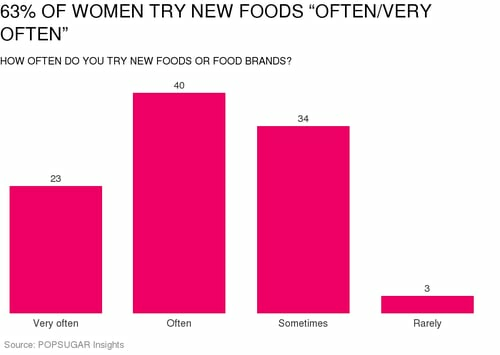 We found that 63% of women often try new foods or food brands, with 23% of women saying that they try new foods "very often" and 40% of women saying they "often" try new foods or food brands. Thirty-four percent of women said they sometimes try new foods, and only 3% of women that we surveyed said they rarely try new foods.